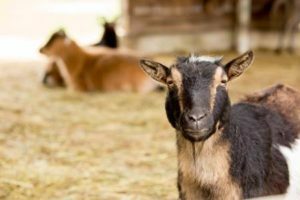 Not everyone is able to provide the required shelter or long-term financial commitment needed to rescue a farm animal. 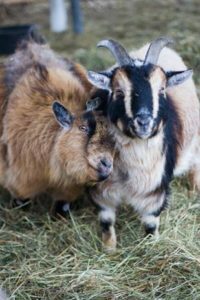 Sponsorships offer a unique opportunity to compassionate people who would personally rescue as many animals as they could – that is if they had the proper housing, zoning, and time to devote to animal care. Our program is designed to help meet the expenses of the sanctuary while allowing you to take a personal interest in the life of an individual animal. 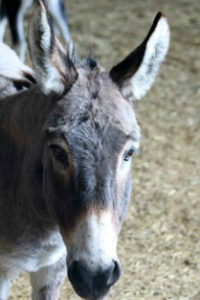 For as little as $30.00 a month you can sponsor an animal resident. Your donation will go directly toward shelter, food and medical care of the animal of your choice. Sponsorships also make a great gift for you animal-loving family and friends. If interested in sponsoring one of the Sanctuary animals below, please choose the appropriate sponsorship button next to their picture. Grace is a lovely older, retired Standardbred mare that has found her soft place to land and spend the rest of her years of well-deserved rest here at the Sanctuary. She was rescued in January 2016 by Gerda’s Animal Aid just moments before being loaded on a truck to go to slaughter in Mexico at a feedlot in Pennsylvania. This sweet girl served many years of dedicated work to humans as a harness racehorse, a broodmare and then an Amish buggy horse for many hardworking years. As a result of the work she endured, Grace has very weak hind legs causing her to never be sound to ride or drive again, which is quite alright because she deserves her retirement. She arrived to us very thin, with health issues related to the neglect she experienced prior to rescue, but she is slowly being rehabbed and will now live out the rest of her years happy, healthy and safe. She has an incredible temperament. She is the essence of wisdom and resilience, with a bright spirit. 1 : $30.00 / mos.2 : $50.00 / mos.3 : $100.00 / mos. Tux came to the sanctuary because his owner no longer wanted him to have to work in the pulling competitions at county fairs. He was at first shy and leery of people, but over time he has become much more trusting. 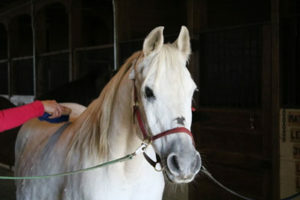 He is a draft horse gelding in his early teens with a kind-hearted, “puppy dog personality” and cherishes his time turned out with his pals, Leander and Lexi. Julie is one of the smaller pygmy goats, along with Lily and Matilda. 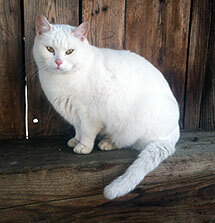 She has a beautiful buttermilk coat and an intense curiosity, though is the most skittish of the goats. She is particularly fond of Melvin and was the first goat that he bonded with upon arriving at the sanctuary. 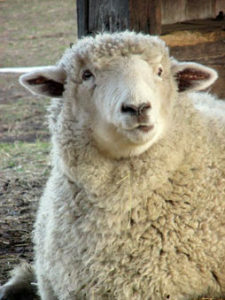 Melvin is a young Shetland Sheep ram who, except for the sanctuary, would have been slaughtered as a lamb. He is very domesticated and may think he is a dog at times. Every Spring his wool is shorn and by the time the weather gets cold again he has a nice, thick wooly coat. Melvin enjoys his time playing with the little goats in the goat pen. Leander was rescued by us at a very young age to give him the opportunity of a full life because he has a congenital spinal condition called “Wobblers” that causes periodid ataxia (unsteadiness) that prevents his being ridden. 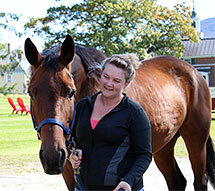 Leander is a Thoroughbred gelding in his early teens. He is very playful and can sometimes be a bit mouthy or “nippy”, but is not mean-spirited one bit. He does not let his condition prevent him from enjoying life and can often times be seen running, rearing and bucking with his pasture-mates. Our donkey (a Jenny, or female) was bought with her mother (who died a few years ago) from a local fair after she was foaled in a van on the way to Vermont from Kentucky. At the time, Emmy was a few months old and sickly. 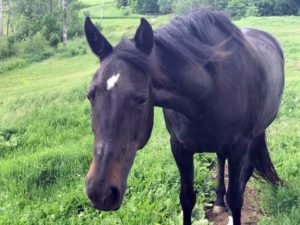 After coming to the farm, she had to spend 14 days recovering from malnutrition and pneumonia at the Rochester Equine Clinic in southern New Hampshire. Emmy is now very healthy and frisky, and loves to be in with the horses. 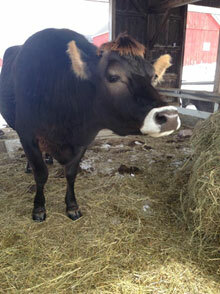 Cabot was rescued from a farm by a young woman just before he was to be processed for veal. She had befriended him almost since birth and called us quite upset when she learned of the fate that was planned for him. At first, Cabot was so small that he had to be kept from the larger cows we have rescued, but now he is big and strong enough to be with them out in the large field, and he seems to like that a lot. He is the friendliest of the cows, probably because he was treated so well by the young woman who asked us to take him in. 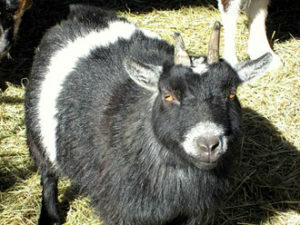 Lily is a miniature goat, known as a pygmy goat with Oreo cookie markings. She is one of two of the smallest of the little goats. She is tiny but feisty and can be found instigating her siblings and mother to play; butting heads, running, and bucking about the pen. 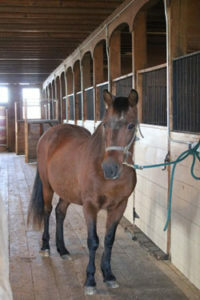 Columbo aka “Bo” is an aged Paso Fino gelding in his early 30s. He came to us, along with Pasha, from a very attentive and loving local woman who because of age and illness in her home could no longer care for him. He has a magnificent, classic gait and a very wise, stubborn; yet inquisitive manner. Bo is very connected to Pasha as they have spent many years together and gets very upset when they are separated so we keep them close as possible at all times. Bo, from a very attentive and loving local woman who because of age and illness in her home could no longer care for him. He is a very kind old gentleman and healthy for his age. He developed heaves, a breathing condition which causes coughing, wheezing and difficulty breathing when not properly managed, but is currently well controlled with specialized dust-free bagged hay, a clean stall and plenty of turnout for fresh air. Along with Bo, Pasha has very little quality teeth left so he is fed a diet of complete senior feed, beet pulp and hay pellets soaked to get his proper feed intake. Lucy came to us after living as a stray for the first year of life. She was thin and in poor health, however, with a bit of quality veterinary care and some love, her life is turning around. Lucy is incredibly brave and smart. She follows the caretakers of the animals around the grounds as they do their tasks, greets every animal and is quite successful at mouse patrol. She and Buster are becoming fast friends, loving to chase and play with one another. 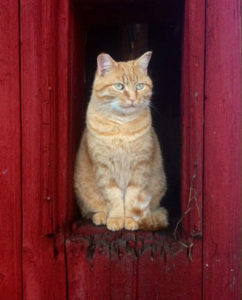 Buster came to us from a kind woman who had taken him in as a stray. 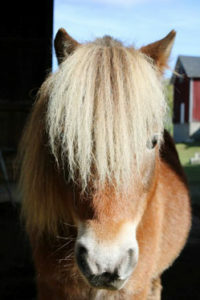 He is a young, playful boy that is finding life on the farm very fun and adventurous. He has taken over “mouse patrol” duties for Daphne. 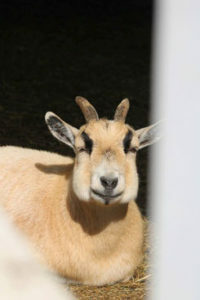 Luke is one of the two larger male pygmy goats. He has very handsome, long symmetrical horns and a very proud demeanor. He loves to be scratched all over and to romp around with his brother and sisters, butting heads. 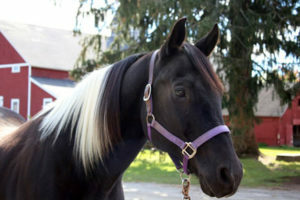 Lexi is an eye-catching black and white Paint horse mare in her 20s. She is beautiful and she knows it! 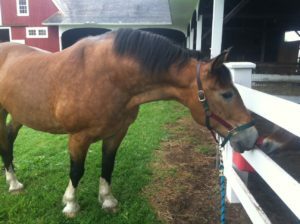 Lexi came to us after being rescued from a life of over-breeding as a broodmare for draft horse crosses, as well as a traumatic trailering accident that caused her to sustain trauma to her head when being forced onto a horse trailer. 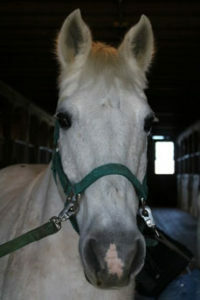 After a few months of rehabilitation and settling back into “being a horse”, Lexi served as a trail riding horse at a NH resort. After Lexi was deemed unsafe for riding due to residual dangerous effects of her accident, the decision was then made by the young woman who had taken her in from her original rescuer to retire her to us at the sanctuary where she can comfortably spend happy days out in the pasture with her herdmates. 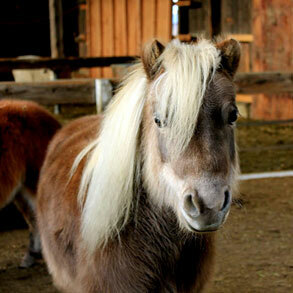 Sassy was party of a family of miniature horses rescued in January 2015 during a violent and cold blizzard. She and her herd-mates were emaciated and very neglected, needing months of rehabilitation to return to full health. Sassy is now very happy and healthy, and living up to her name! She demands respect and attention of humans, and loves to be told how beautiful she is. The satisfaction of knowing that you are helping to save an animal from abuse, neglect or abandonment. To sponsor a resident, please contact us at 802- 626-9924. Email us, or click on a sponsorship button to pay online using PayPal or any major Credit Card. Thank you for making a Regular Monthly Donation to assist in our Animal Rescue and Maintenance Efforts.